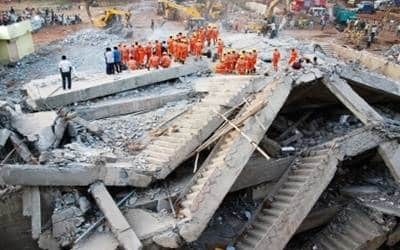 Bengaluru, March 22 (IANS) The death toll in the building collapse in Karnataka’s Dharwad on Tuesday rose to 14, whereas 60 people have been rescued so far, officials said on Friday. A man was rescued on Friday morning after being trapped for nearly 60 hours. "A total of 14 people have died. Two people were rescued on Thursday," Dharwad Deputy Commissioner M. Deepa told the media at the accident site, about 400 km northwest of here. Three people were still suspected to be trapped in the debris, Assistant Commissioner of Police A.S. Bhoomareddy said. "Oxygen and oral rehydration solutions were given to those still trapped," Bhoomareddy told IANS from Dharwad. Chief Minister H.D. Kumaraswamy announced Rs 2 lakh compensation to the kin of the deceased. All four owners of the building under construction surrendered before the police on Thursday night after a case was registered against them. The building’s engineer was also taken into police custody. A magisterial inquiry, to be headed by a Deputy Commissioner, was ordered into the accident. Personnel from the National Disaster Response Force, the State Disaster Response Force and fire and emergency services are conducting the rescue work.